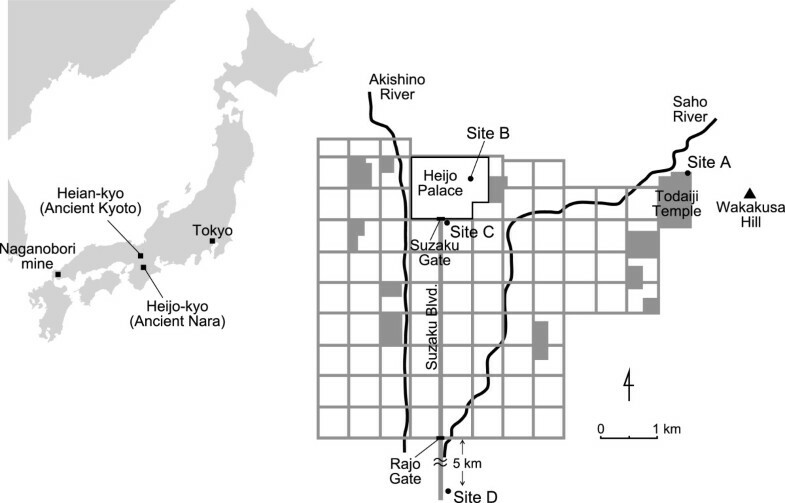 We quantitatively investigated the eighth century heavy metal pollution in Heijo-kyo (Ancient Nara), the first large, international city of Japan. In this metropolis, mercury, copper, and lead levels in soil were increased by urban activity and by the construction of the Great Buddha statue, Nara Daibutsu. Mercury and copper pollution associated with the construction of the statue was particularly high in the immediate vicinity of the statue, but markedly lower in the wider city environment. We therefore reject the hypothesis that extensive mercury pollution associated with the construction of the Nara Daibutsu made it necessary to abandon Ancient Nara, even though severe lead pollution was detected at several sites. The isotopic composition of the lead indicated that it originated mainly from the Naganobori mine in Yamaguchi, which was a major source of the copper for the Nara Daibutsu. Human civilizations are physical spheres of human activity on earth. This human activity is typically associated with pollution, which results in environments becoming dangerous to live in, or in which chemical substances or energy may become limited (Matsui 2007). Although pollution increased dramatically during the industrial revolution, the material cycle was also affected by ancient human activity, especially mining and smelting. For example, the rate of atmospheric Pb deposition in the Jura Mountains of Switzerland has been affected appreciably by human activity over the last 2,100 years, with rates of deposition during this period being at least 10 times that of the original natural flux (Shotyk et al. 1998). The establishment of large cities in ancient times would lead to chemical pollution, mainly due to their large populations and the commencement of the metal-working industries. However, the extent of these ancient episodes of pollution has not yet been quantified. Heijo-kyo (Ancient Nara) was Japan's second capital and the first large and international city (from 710 to 784 A.D.). Although Fujiwara-kyo, the layout of which is based on the grid of a Chinese city, is officially considered to be Japan's first capital, it was a small city that only served as the capital for 6 years after construction was completed. Heijo-kyo is a registered UNESCO World Heritage site (http://whc.unesco.org/en/list/870) (Figure 1). It had a maximum population of 50,000 to 200,000, making it half the size of Constantinople (Istanbul) at that time (Japan Broadcasting Corporation 2012), and a high population density of 2,000 to 8,000 people km−2. The city covered approximately 25 km2 and had an irregular rectangular shape modeled after Chang'an, the capital city of Tang Dynasty China. Numerous foreign visitors traveled to Ancient Nara where they introduced their cultures. These visitors included traders and Buddhist monks from China, Korea, India, and Vietnam. Buddhism prospered and was particularly influential in politics where it was adopted by the government and propagated by foreign priests. As a result, the Tenpyo Culture was developed, a lowery culture strongly connected to Buddhism (UNESCO World Heritage site; Hall 1993). A number of great temples and religious structures were established during this time, one of which was Todaiji Temple, which is famous for its very large Buddha statue known in Japanese as the Nara Daibutsu. The Great Buddha of Nara is the world's largest gilt bronze statue of Buddha. The statue, which is approximately 15 m tall and is seated in a cross-legged position (Figure 2), was built in response to repeated outbreaks of smallpox in Japan in the 730 s A.D. (Hall 1993). The statue was constructed in the following stages: (1) A rough framework was constructed from wood and other materials and then covered with micaceous clay, from which the features of the statue were sculpted. (2) After the sculpted clay surface had dried, a mixture of sand and clay was laid over the clay form, baked, and removed in sections to serve as the outer mold. (3) After removal of the outer mold, the clay form was pared down so that it could serve as the inner mold. The completion of these three stages took almost 2 years. (4) The outer mold was reassembled around the inner mold and (5) smelted bronze was poured into the space between the two molds. Because the statue was so high, the last two stages were repeated eight times over the course of 4 years to complete the casting, starting from the bottom of the statue and working toward the top. (6) After the outer mold was removed, the surface of the statue was gilded by the amalgamation method. To make the amalgam, Au was dissolved in Hg at a ratio of about 1:5. After this fluid was applied to the statue, the surface was broiled to evaporate the Hg, leaving a uniform layer of Au on the surface. Emperor Shomu issued an imperial decree to build the great statue of Buddha, intending to resolve the national crisis through Buddha's divine protection (Hall 1993). The hall of the Buddha was also the largest ancient wooden structure in the world, although the ‘Metropol Parasol’ in Seville, Spain, is currently the largest such structure in the world (Moore 2011). Location of Ancient Nara in Japan, with inset showing soil sampling sites and other relevant locations in and around the city. The streets of Ancient Nara had ditches on both sides. These ditches functioned as drains or sewers, carrying polluted water into the main rivers. People may have indiscriminately disposed of waste materials in such ditches, occasionally even human skulls. Photographs and schematic representation of the Nara Daibutsu. (A) Current Great Buddha Hall (Daibutsuden), which is 57.5 m wide, 50.5 m deep, and 49.1 m tall. It was rebuilt in 1691 A.D. due to fire. The original hall was even larger and had a width of 86 m. (B, C) Great Buddha. Processes involved in the production of the Buddha were as follows: More than 2 million people were reportedly involved in this project, even though the total population of Japan was 5 million at that time (Kito 2000). It has been considered that Ancient Nara may have been polluted by urban activity, particularly by activities associated with the construction of the Nara Daibutsu, which was made of 499,000 kg of Cu and 8,500 kg of Sn and gilded with 146 kg of Au and 820 kg of Hg (Konishi 2002). The statue was gilded by the amalgamation method, in which an amalgam of Hg and Au was applied to the surface and then heated to evaporate the Hg. Shirasuga (2002) hypothesized that the Hg that was released into the environment around Ancient Nara due to the construction of the Nara Daibutsu caused people in the area to suffer significantly from an unidentified ‘strange disease’ and that the government was forced to relocate to a new capital for fear of an evil curse or divine punishment. He also proposed that careless disposal of waste materials from the copper refining process was primarily responsible for a treeless, grass-covered hill located to the east of Todaiji Temple. Although these theories have little supporting historical or scientific evidence, they have nevertheless persisted in popular culture and are often cited in Japanese television programs on the Nara Daibutsu. Another explanation for the relocation of the capital city may have been because Emperor Kammu wished to relocate the capital to an area with better transportation routes, and/or to escape the power of the Buddhist clergy (Hall 1993). Urban activity is known to pollute the environment on both local and regional scales, and in a city as large as Ancient Nara, people would have relied on the natural environment to dispose of their sewage and other waste. They may have buried their waste in large holes or in ditches, practices which may have led to the accumulation of waste and pollutants. In this study, we provide quantitative data for the presence of toxic heavy metals, such as Hg, Pb, Cu, and Fe, in ancient soil samples and remains collected from archeological sites in Ancient Nara. Furthermore, we evaluate the effect of urban activity on ancient metal pollution and discuss the environmental effects associated with the construction of the Nara Daibutsu. The archeological site of Ancient Nara is located within the modern city of Nara, which is surrounded by mountains on three sides and is located at the northern end of the Nara Basin in the Kansai region of Japan (Figure 1). The dominant soils consist of terrace deposits, derived from metamorphic mudstone and biotite granite from the Saho River. Metal pollution has not been reported in this area in recent times as mining for metals is no longer conducted in the region (Ozaki 2000). Nara has a mild climate, with mean temperatures ranging between 3.8°C (January) and 26.6°C (August). The mean annual rainfall is 1,333 mm and the direction of the prevailing winds is southeast in summer and northwest in winter (Nara Meteorological Observatory 2014). Ancient soil samples were carefully collected from four historic sites in and around Ancient Nara (Figure 1) under the supervision of archeologists (Table 1). The age of each sample was determined based on any artifacts that were present, from writings on mokkan (long, thin, narrow pieces of wood strung together that were used to write on in ancient times), and from other archeological evidence. The sampled soil sediments had not been disturbed and heavy metal contamination by subsequent overprinting is not suspected because Ancient Nara became an agricultural area after the capital moved to Kyoto, and the soil sediments remained deeply buried for more than 1,000 years (Hall 1993). Site A is located 20 m north of a section of the hall that housed the Nara Daibutsu in Todaiji Temple in approximately 750 A.D. (Figure 3). Three kinds of samples were taken from a pit that was excavated for the construction of a drain pipe in October 2011. The samples were classified based on a description of the cross section of this section by the Buried Cultural Property Investigation Center (Figure 3; personal communication with Mr. M. Kanekata and Mr. T. Yasui; Board of Education of Nara City 2011). Sampling was supervised by Mr. Kanekata and Mr. Yasui (Board of Education of Nara City 2011). Sample 1 was dated to the middle of the Nara period (around 750 A.D.) on the basis of the presence of many copper particles originating from the bronze blast furnace used in the construction of the Nara Daibutsu (Ishino 2004). Therefore, sample 1 is assumed to represent direct metal contamination (Figure 3). Samples 2 and 3 were dated to the 12th and 16th centuries, respectively, because they contained debris and soils which corresponded to fires in 1180 and 1567 A.D. that destroyed the wooden structures housing the statue. Detailed soil map at Site A and sketch showing exact location and stratigraphic position of samples. Source: Board of Education of Nara City 2011. Site B was situated inside the central palace, the home of the imperial family and the location of the central governmental offices. Currently, excavations and investigations of this area are performed under the auspices of the Nara National Research Institute for Cultural Properties. These samples were collected from a dump in this area in order to estimate the pollution associated with garbage at the palace in the very center of Ancient Nara. The artifacts present in these samples were dated from the late eighth century (Nara National Research Institute for Cultural Properties 2010, 2012a). Site C was located in front of Suzaku-mon, the south main gate of the palace. Eighteen samples were collected in order to evaluate the levels of pollution in the early stages of urban activity: the soil layers here corresponded to the foundation of Ancient Nara in the early eighth century, and iron blacksmiths are considered to have operated around the corner in the early eighth century (Nara National Research Institute for Cultural Properties 2012a, [b]; personal communication, Dr. Jinno). Samples 203, 204, 205, 206, and 207 were from the early eighth century. Sample 210 dated from a rice paddy in the 9th to 11th centuries. Site D was located approximately 5 km south of the center of Ancient Nara (Archaeological Institute of Kashihara 2012a, [b]). Ten soil samples were collected from a ditch along Suzaku Boulevard, which was an extension of the central avenue, supervised by Dr. Kinoshita and other archeologists working for the Archaeological Institute of Kashihara in Nara Prefecture. Three of these samples were selected for the analysis of sewage and to determine the level of background pollution in the ancient city. The samples consisted of muddy soils from the early to late eighth century (Figure 4) (Archaeological Institute of Kashihara 2012a, [b]). Sketch showing exact location and stratigraphic position of samples at Site D. Source: Archaeological Institute of Kashihara, 2012a, [b]. The Naganobori mine in Yamaguchi Prefecture in western Honshu is a skarn-type deposit that produced mainly Cu and Pb. The ore is a contact deposit between Paleozoic Akiyoshi-dai limestone and granite porphyry. The mine had been used since the late seventh century and is known to have supplied almost all of the Cu used in the construction of the Nara Daibutsu (Mitochou Compilation Committee 2004). The Naganobori mine was called Nara-nobori mine in seventh century because ‘Nara-nobori’ means ‘Cu was transported up to the capital city of Nara’. Each sample was crushed into fine powder and separated into subsamples for elemental analysis. A 200 mg aliquot of each dry bulk sample was digested in an ultrapure mixture of HF and HNO3, and any organic residue was removed by filtration. The solutions were then diluted to 100 ml with ultrapure (Milli-Q) water and then subjected to analysis at the Geological Survey of Japan. Fe, Co, and Ni were analyzed by inductively coupled plasma atomic emission spectrometry (ICP-AES: Seiko Instruments SPS7800, Chiba, Japan). Cu, Pb, Mn, and Zn were analyzed using inductively coupled plasma mass spectrometry (ICP-MS: Agilent 4500 UCO-MS, Tokyo, Japan). Hg was analyzed using vapor atomic absorption spectrometry (AAS: Japan Instruments Mercury/MA-2000, Tokyo, Japan). A reference rock standard (JSO-1, Geological Survey of Japan) was used to calibrate samples as well as standard solutions prepared from pure elemental standard solutions (Wako Pure Chemical Industry Ltd., Osaka, Japan). Analytical error was estimated to be less than 10% for each elemental analysis (Kawahata et al. 2006), which is considered to be smaller than the variation attributed to ubiquity in soil. The digested samples were dried and dissolved in 0.5 M HBr. Two slag samples and chrysocolla from the Naganobori mine were also prepared after decomposition by HF-HNO3. Pb was then purified using 0.5 ml anion exchange resin (Bio-Rad AG 1-X8). Other elements were eluted using 3.0 ml of 0.5 M HBr, and the Pb fraction was collected using 4.0 ml of 6 M HCl. The procedural Pb blank was 50 pg during chemical separation, which was negligible compared with the sample values of >1,200 ng Pb. Pb isotopic ratios were determined at the Geological Survey of Japan using MC-ICP-MS (NEPTUNE multicollector ICP-MS, Thermo Finnigan, Germany) with a Tl doping technique. Samples were diluted to approximately 200 ppb. Pb based upon previous determinations. In addition to four Pb isotopes (204Pb, 206Pb, 207Pb and 208Pb), 202Hg was also measured to subtract the 204Hg signal from 204Pb. A sample-standard bracketing method was used to correct for instrumental mass bias, using a Pb standard solution prepared from a reference standard (SRM 981, National Institute of Standards and Technology, Gaithersburg, MD, USA). For comparison, a Pb solution prepared from another reference standard (SRM 982, National Institute of Standards and Technology, USA) was also analyzed. The mean 206Pb/204Pb, 207Pb/204Pb, and 208Pb/204Pb values of NIST SRM981 (n = 34) were 16.9315 ± 0.0025, 15.4847 ± 0.0031, and 36.6772 ± 0.0079, respectively (mean ± 2 standard deviations). The results of metal and Pb isotope analyses for each of the soil samples are given in Table 1. Hg content ranged from 39 to 521 ppb, with a mean of 160 ppb. The two lowest values, 39 and 45 ppb, might reflect the background Hg level in Ancient Nara because the corresponding samples (samples 203 and 38) date to the late seventh century or early eighth century (Figure 5). Samples 204, 205, 206, and 207, which also had relatively low Hg contents (59 to 92 ppb), date to the early and middle eighth century. Samples 1-A and 1-B had low Hg contents (66 and 92 ppb, respectively); these samples were obtained from heaps of soil produced during the construction of the Nara Daibutsu and, therefore, date from just before the mercury-gold gilding of the statue was undertaken. Conversely, samples 2, 3, and 210, which are younger than that of the ninth century, had Hg contents of at least 200 ppb. The maximum value of 521 ppb was observed in sample 211, which dates from between 1870 and 1960 and is, thus, probably due to modern contamination. Large amounts of Hg were released into the environment in the 19th and 20th centuries due to the operation of coal-fired power plants and the use of Hg in electric lights, batteries, electrodes for sodium hydroxide production, and wood preservation (Japan Oil, Gas and Metals National Corporation 2010). Hg, Cu, and Pb contents in samples 211, 208, 38, 31, and 1-A. Cu levels varied from 2.3 to 370 ppm, with a mean of 37 ppm. Samples from the early eighth century showed that the background level of Cu was around 5 ppm. The highest values (>50 ppm) were observed in the samples from Site A, which was contaminated by copper slag that splashed out of the blast furnaces when the Nara Daibutsu was cast. Pb content varied markedly, ranging between 13 and 1,200 ppm. The highest Pb levels (>1,000 ppm) were observed in samples 208 and 204, which came from an ironsmith dump site dating from the early-middle eighth century. Samples 34 and 31 from a ditch running along the central avenue also had high Pb contents (700 to 900 ppm). Interestingly, the mean level of Pb in Ancient Nara (330 ppm) was considerably higher than the geochemical background level of 30 ppm around the modern city of Nara. The levels of Fe, Mn, Co, Ni, and Zn in the soil were all rather low and fell within the ranges observed in modern natural soils in Japan (Imai et al. 2004). Specifically, Fe, Mn, Co, Ni, and Zn ranged between 5,800 to 61,000 ppm (mean 26,300 ppm), 92 to 2,300 ppm (mean 425 ppm), 4.8 to 32 ppm (mean 14 ppm), <29 ppm, and 20 to 140 ppm (mean 50 ppm), respectively. The contents of the latter four metals were all correlated with the content of Fe, suggesting that these five elements are present in the same clay minerals and other soil materials. Pb isotope ratios were relatively similar among all the soil samples studied: 207Pb/206Pb ranged from 0.850 to 0.851 and 208Pb/206Pb ranged from 2.093 to 2.094. 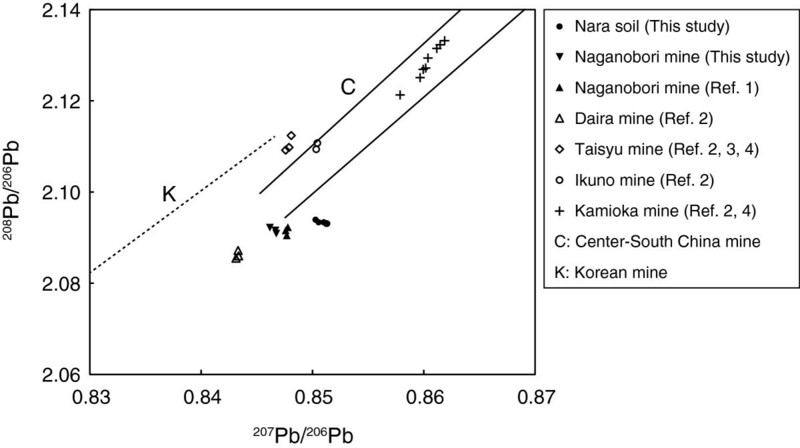 The Pb isotope compositions of the samples from the Naganobori mine (207Pb/206Pb = 0.846 to 0.847 and 208Pb/206Pb = 2.091 to 2.092) were consistent with a previous study (207Pb/206Pb = 0.848 and 208Pb/206Pb = 2.091 to 2.092; Saito et al. 2002). The level of Hg pollution can be estimated if the size of the area over which the pollution occurred is known. Heijoyo in the Nara Basin measures about 5 km by 5 to 7 km and the soil layers in the basin are typically several centimeters to 20 cm thick (Figure 4). Consequently, if 820 kg of Hg was uniformly distributed in 5 or 10 cm thick soil layers (density 1.0 g cm−3) in a circular area with a 3 km radius in the Nara Basin, then the Hg concentration would have been approximately 600 or 300 ppb, respectively. The results of this study suggest that the Hg content in ancient soil in the middle and late eighth century (around 100 ppb) was not that high (Table 1). Even samples from the twelfth to eighteenth centuries that were collected in the district adjacent to the Nara Daibutsu had Hg levels of 200 to 300 ppb. Similar Hg contents were observed in the eighth century soil samples 100 and 106 collected in the palace grounds of Ancient Nara. The other samples had relatively low Hg contents. Assuming that the background level in this area was approximately 50 ppb before construction of the Nara Daibutsu, as estimated above, it appears that although Hg levels increased considerably when the statue was constructed, Ancient Nara was not severely polluted. There are two possible reasons that might explain the discrepancy between the estimated and measured values: (1) Hg, which is volatile, may have evaporated from the soil (Pirrone et al. 2001), (2) Hg might have been transported to other areas over time. Regarding the second possibility, the district to the north of Nara Daibutsu is currently flat but it was a hollow depression between the eighth to the sixteenth centuries when it would have received debris and soils from fires that burned the wooden structures housing the Nara Daibutsu in 1180 A.D. and 1567 A.D. Nonetheless, samples collected from this area, i.e., samples 1 (middle eighth century), 2 (twelfth century), and 3 (sixteenth century), had relatively low Hg contents, implying that Hg transfer was not a main factor. The soil in Ancient Nara had low Hg levels during the early eighth century; however, these levels more than doubled after the middle eighth century, possibly due to pollution from the construction of the Nara Daibutsu. In addition, there may have been other pollution sources, as a single point source of pollution would not explain the observed increase in background Hg levels after the mid-Nara era. It is well known that cinnabar has been used for a spell and/or preservative agent for more than 2,000 years (Naruse 1991; Mitochou Compilation Committee 2004), but it was relatively expensive and would likely have been used to a limited extent. where C is 2.3 × 10−6 mole, which is more than 100 times the upper limit of the modern environmental standard in Japan, 0.02 ppm. As the molar mass of Hg is 220.59 g mol−1, 4.55 × 10−4 g of Hg exists in 1 mole of atmosphere, suggesting that the inside of the Great Buddha Hall was severely polluted when gilding was undertaken and that, afterward, an appreciable amount of Hg continuously and, rather rapidly, evaporated from the soil into the atmosphere. Indeed, this evaporation would explain why less than half of the total amount of Hg used in the construction of the Nara Daibutsu was present in the soil, even as soon as the middle and late Nara period. These lines of evidence suggest that a limited area around the Great Buddha may have been severely polluted during the gilding, but that Ancient Nara was only moderately polluted with Hg since the eighth century, probably due to the construction of the Nara Daibutsu as well as the use of cinnabar in the region. The evidence does not support the hypothesis that severe Hg pollution forced the capital to be relocated from Nara to Kyoto. High Cu contents were observed in samples 1, 2, and 3, which contained copper slag from the construction of the Nara Daibutsu. The highest level observed (355 ppm) is well above the upper limit of existing Japanese regulations (125 ppm). Conversely, samples from the other sites had relatively little Cu, and background levels were probably a few parts per million. The higher levels observed in some of the samples (i.e. >10 ppm) may have been due to the widespread use of Cu in mirrors, coins, bronze statues, and arms at the time. A more likely explanation for the presence of the grassland (instead of a forest) at Wakakusa Hill was not because of pollution, but rather because the field was burned every year as part of a New Year celebration. 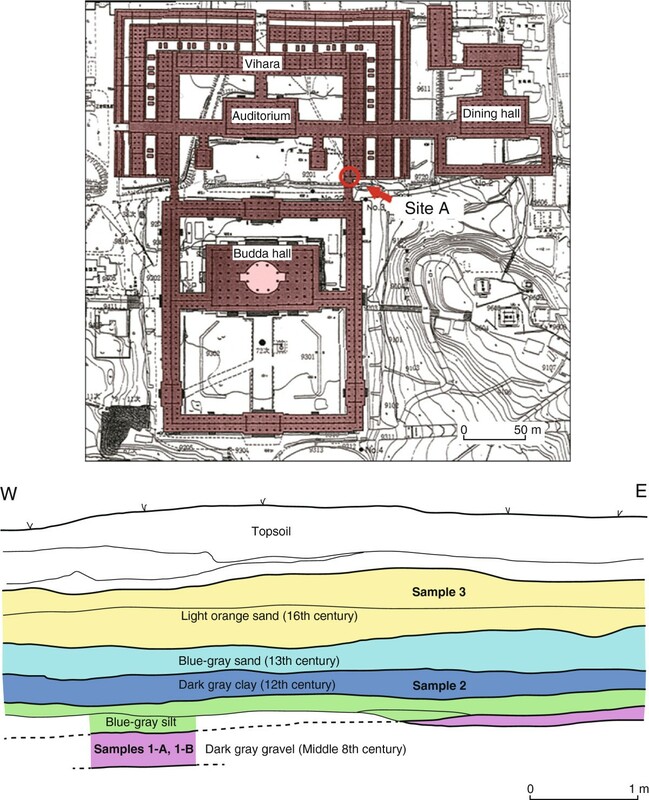 In summary, our results suggest that Hg and Cu pollution accompanying the construction of the Nara Daibutsu only had a limited influence on the environment. Analysis of soils from Ancient Nara suggests that traces of ancient human activity are indeed evident in the environment. Both the extent of the contamination and the nature of the contaminants are generally consistent with the features of human activity in Ancient Nara. The contamination in samples 31 and 34 from the ancient ditch is considered to be due to urban pollution. According to historical documents, the ditch was quite dirty and contained the remains of humans, cattle, and horses, suggesting that people may have indiscriminately disposed of waste in these ditches (Archaeological Institute of Kashihara 2012a, [b]). Further, although water from the Saho River was diverted into the ditch, it was too weak to flush out the sewage efficiently (Figure 1). Hg, Pb, Fe, and Cu were also materials that were in common use in the Nara period. Hg and Pb were used for pigments, enamel, and/or lead glass; Cu and Sn were used for producing bronze coins and statues. Malachite is a copper carbonate hydroxide mineral which was used as a green pigment and Fe oxide (hematite) was used as a red pigment (Kitano 2013). Comparing the Hg, Cu, and Pb contents of Ancient Nara to modern standards reveals that only Pb (over 330 ppm) exceeded modern levels (15 ppm for Hg, 125 ppm for Cu, and 150 ppm for Pb). The particularly high contents observed in samples 208 and 204 could be related to the high Pb content at site C. Indeed, the observed level of Pb contamination is considered harmful for human health. For example, if you inhaled 150 mg of soil per day that was contaminated with 200 ppm of Pb, and if the absorption efficiency was 40%, then 100 mg of Pb would accumulate in your body over a 20-year period and potentially cause lead poisoning (Yamada 1977). Thus, although it has been postulated that people living near blacksmiths in Ancient Nara may have suffered from lead poisoning, these smiths employed mainly iron, which means that it was unlikely that they were responsible for the lead contamination in the soil. However, further investigation is needed to determine whether Pb contamination was observed throughout the city. The various isotopes of Pb provide an ideal tool for characterizing the original source of heavy metal pollution because the isotopic ratios are not measurably influenced by physical or chemical fractionation processes. Thus, when the 207Pb/206Pb and 208Pb/206Pb ratios of the Ancient Nara soil samples were compared to the ratios observed in various foreign artifacts (mirrors and swords from China and Korea) or in samples from various Japanese mines, the results show that the most plausible origin of the Pb in Ancient Nara was the Naganobori mine. Figure 6 shows that when the Pb isotope ratios of the soil samples were plotted against those of the Naganobori mine, the curves were similar. This mine was thus undoubtedly the source of Cu for the production of the Nara Daibutsu. Indeed, this dependence on the mine is documented in historical records, namely, on narrow strips of wood upon which official messages were written during the Nara Period (Mitochou Compilation Committee 2004): this is also evidenced by the higher relative abundance of Ag and As (Hatanaka 2003). This study reconfirmed that the Pb isotope ratios in sample 1-A, which contained drops of copper from the construction of the Nara Daibutsu, were similar to those in samples obtained from the Naganobori mine. In addition, the Pb isotopic value is the same as that in all the other solid samples in Ancient Nara. We therefore conclude that all of the Pb contamination in Ancient Nara originated from the Naganobori mine. The extraction of ore at Naganobori contributed considerably to the production of the Nara Daibutsu. 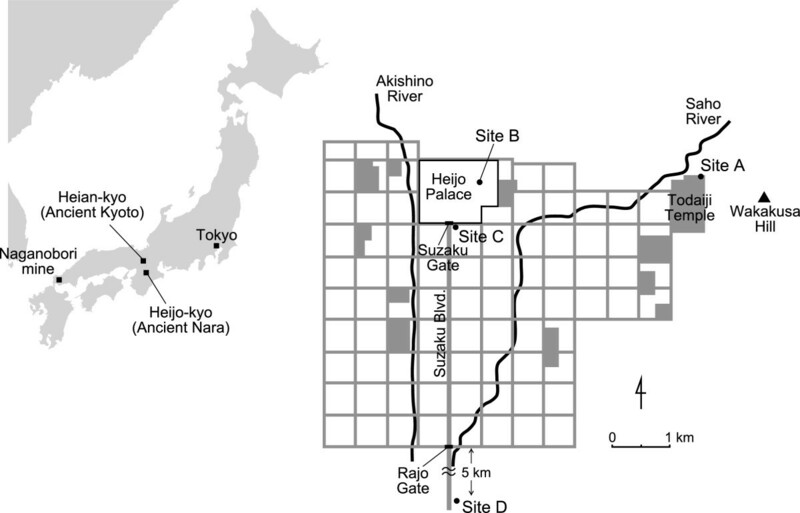 However, the mining activity associated with the construction of the Nara Daibutsu may also have generated Pb pollution in the capital city, even in ancient times. Pb isotopic ratios ( 208 Pb/ 206 Pb versus 207 Pb/ 206 Pb) in Ancient Nara soil samples and reference ore deposits. C (area between solid lines) represents bronze mirrors brought from China during the Eastern Han Dynasty and the Three Kingdoms era (25 to 280 A.D.) with Pb originating from central to southern China; K (dashed line) represents a bronze mirror and swords brought from the Korean Peninsula during the Yayoi era (10 B.C. to 3 A.D.) with Pb originating from the Korean Peninsula (Saito et al. 2002). Data from (1) Saito et al. 2002; (2) Sasaki et al. 1982; (3) Mabuchi and Hirao 1982; and (4) Mabuchi and Hirao 1987. Although it is currently difficult to identify the exact source of Pb contamination, several possible sources exist. A number of studies on Pb isotopes have examined bronze coins (Mabuchi et al. 1982; Saito 2001a; Saito et al. 2002). However, it is considered unlikely that these coins would have increased the Pb content of environmental samples, such as the soils in urban areas because of distribution amount. Based on an analysis of the inorganic pigments used to decorate treasures at Shosoin, the Imperial Repository constructed to prevent damage arising from the humid Japanese climate, lead-based pigments may have been relatively popular (Naruse 2004). Although it was reported that lead carbonate (lead white) was not produced in Japan and that it was imported from China during the Nara era (Winter 1981), lead chloride produced in Japan was widely used for white paint (Naruse 1992; Winter and Emile 1988). According to a production report from a government-run workshop of Buddhist sculptors during the Nara Period in 734 A.D., red lead was made from metallic lead in order to produce lead glass (Naruse 1991). Lead isotope analysis of tricolored glaze dating from the Nara Period showed that the Pb isotopic composition was comparable to that from the Naganobori mine (Saito 2001b). Further study is required to understand the extent of environmental pollution in this ancient civilization. During the seventh and eighth centuries, many religious structures, such as temples and statues, as well as tumuli, were constructed in Japan. The material requirements of large bronze statues were considerable, as exemplified by the Nara Daibutsu; and the tumuli of the previous era were associated with large numbers of terra-cotta figures, whose firing required large quantities of wood fuel. Relocations of the capital city were also frequent and entailed extensive utilization of wood resources for the construction of new buildings. The end of the burial tradition and the beginning of the Buddhist practice of cremation occurred in the eighth century. The first person to be officially cremated in Japan was the Buddhist priest Dosho in 700 A.D., and the first emperor to be cremated was Jito in 702 A.D. According to historical records, the government recommended restraint regarding the construction of large tumuli in the seventh century (personal communication, Dr. Kinoshita). After the relocation of the capital to Ancient Kyoto in 794 A.D., no more large bronze statues were built around Nara and Kyoto. Japanese society had already started to shift away from mass consumption to a more sustainable system during the Nara period. Urban activity increased the levels of Hg, Cu, and Pb in soils. Hg and Cu pollution accompanied the construction of the Nara Daibutsu, but the influence of this pollution was limited to a section of the city. At several sites, the soil was polluted with enough Pb to harm human health, with some of these values exceeding modern Japanese safety standards. The isotopic composition of Pb in these soils indicated that it originated mainly from the Naganobori mine. The mine made a major contribution to the founding of the Nara Daibutsu and was a source of some of the observed lead pollution. HK is a Professor at the Atmosphere and Ocean Research Institute, The University of Tokyo. He has focused on geochemical studies for the last 30 years and has published approximately 200 papers in international journals. He has received more than 3,000 citations. SY was a undergraduate course student at the laboratory of HK. KY, TO, GS, and MI are also geochemists with considerable experience in chemical and isotope analysis. We sincerely thank Dr. A. Watanabe and Dr. M. Jinno at the Nara National Research Institute for Cultural Properties, Dr. F. Sugaya, Dr. K. Saito, Dr. W. Kinoshita, and Dr. T. Fukunishi at Archaeological Institute of Kashihara, Nara Prefecture, Mr. M. Kanekata and Mr. T. Yasui at the Buried Cultural Property Investigation Center of Nara, and Mr. Y. Ikeda at the Culture Exchange Hall of Naganobori Mining for providing archeological soil samples and related data for this study. We also acknowledge Prof. K. Takemura and Dr. Y. Shitaoka of the Institute for Geothermal Sciences, Kyoto University for the instruction of archeological studies. Also, we would like to express our sincere appreciation to two anonymous reviewers for improvements to the manuscript. This study was supported by a grant-in-aid for scientific research, 22224009 (H. Kawahata), from the Japan Society for the Promotion of Science. 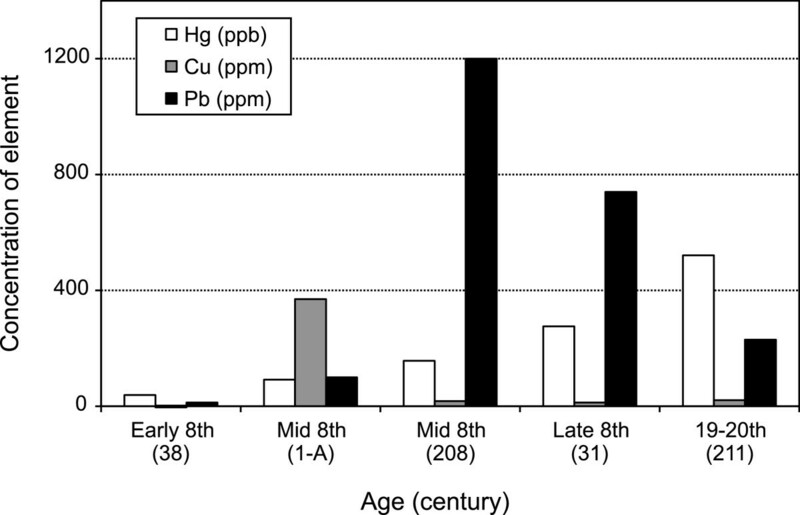 This paper presents quantitative data on Pb isotopes and toxic metals in samples of ancient soil and remains collected from archeological sites in Ancient Nara in order to evaluate the effect of urban activity on ancient metal pollution. Although it has been proposed that pollution resulting from urban activities (especially construction of the Nara Daibutsu) was responsible for the end of Ancient Nara and relocation of the capital, no scientific verification has been conducted to date. The Great Buddha statue is the largest bronze statue in the world and is a registered UNESCO World Heritage site, and it is well known among Japanese and foreign tourists. Therefore, the heavy metal pollution would hopefully receive much attention. This research has important implications for building a sustainable society in the future. HK proposed the topic and conceived and designed the study. SY, KY, and HK collected samples for the study. SY, KY, TO, GS, and MI contributed to the chemical and isotope analysis. All authors read and approved the final manuscript.